Witloof - Endive - Chicon, whatever you call it. This is a great veg, already it has provided summer greens for salads and potato dishes last summer, now it provides a salad and a hearty warm meal. Now the roots could be roasted and added to coffee! One pack of seeds, three uses over 7 months. 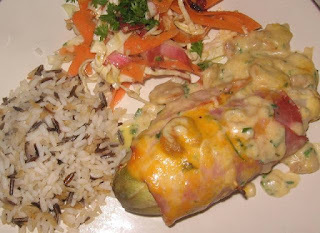 The recipe is based on a meal I had in Ghent, Belgium, and it is a fairly common dish there. I had two types of chicon, one Witloof, the other radichio. The Witloof grew very well over the mild winter despite little attention or care - the radichio was smaller. This meal was designed to show off both of them, a warmed witloof complimented by a radichio koolsla on the side. Coleslaw comes from the German or Dutch Kool-sla, literally cabbage salad. This is not the soggy mayonaise soaked lump we get here, but a fresh and very healthy winter salad. As I have tried to demonstrate with other recipes and processes like zuurkool/ kapusta kizona/Chacroute there are so many more ways to work with cabbage and greens than just boiling them. Preheat oven to 180, while its warming up you can get the rest ready. ham slices, two per chicon. I found and added some sea corriander, but cilantro or corriander will do. Remove any damaged outer leaves from chicon. Overlap two slices of ham. Roll the witloof into the ham, creating a wrap. Secure with a tooth pick. Transfer to a shallow oven dish. When sweated and slightly browned add the flour and work into a roux. Add the milk and grated cheese - reserve some of the cheese to sprinkle over the dish. When the sauce thickens add the chives and stir in, pour over the prepared chicons, sprinkle over a little cheese and chuck in the oven for 20 minutes. In the meantime you can get your real coleslaw made. Take one chicon of endive and chop it up. Get the top half of a small winter cabbage - slice into ribbons, very fine. Remove any part of the core, its the leaves only that you want. Take a carrot, grate - or as I prefer, use a potato peeler to create broad ribbons. Add some raisins or grated apple if you have it - wallnut is also very nice in the mix and this is a great, fresh, crunchy salad.With the honey in the dressing it helps compliment the slight bitterness of the chicon. Add this to 200 ml Donegal rapessed oil and 50ml cider vinegar and shake well. Pour over mixed salad and toss well.